The following text is taken from the book "The Swansea Stage Coach - A Local History". The chapter is called "Monsters from the Past" and was written by Marjorie E. Walkden. "A LARGE boulder north of Swansea Village is known as Abram's Rock. The tall oak trees at its base whisper of the Indians who once trod the ground beneath them or rested in their shade. King Philip himself might have rested here when hard pressed by his enemies. Farther than the eye can reach were the lands of Massasoit. "Swansea has many huge rocks that are named for their weird shape, location, or legends told about them. One has only to know the story and then visit them to realize their importance in the history of the town. 'Thre is hardly a rock, hardly a stone, but which is breathing forth history, ' wrote Orrin Gardner. "The most familiar legend handed on to us about Abram's Rock is that he was a poor Indian who had deserted his tribe, coming to this settlement where he made his living in peace. But King Philip of the Wamponoags decided to take Abram back, fearing his friendship for the white man. Abram found this towering rock as a hiding place. On the west side is a room formed by boulders. It is still called 'Abram's Bedroom' -- after 300 years. He is said to have lived there for several months, til tracked down and captured. He was given a chance for his life. The sentence was death or three leaps from the top of the rock to the ground below. Abram took the chance, and tradition says that his first and second leaps from the towering rock were safely made, but the third jump killed him. "Another legend is that about the middle of the 19th Century a poor family made its home in 'Abram's Kitchen,' and under the roof of rocks a child was born. 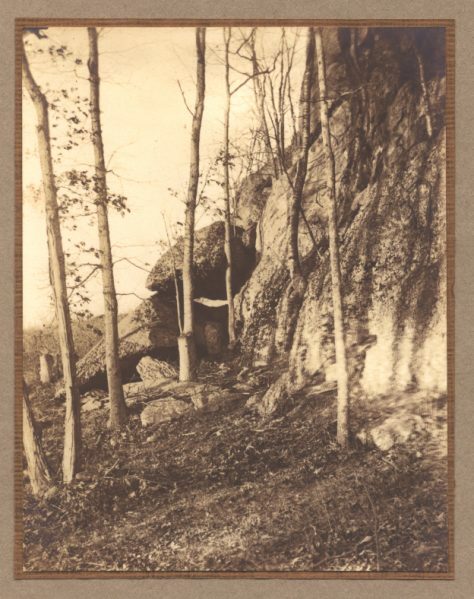 "Abram's Rock, as well as other 'pudding-stone' formations in the area having names like Lion Rock and Wildcat Rock, may be visited by following the trail and cart path from the Town Hall or Christ Church car lots."